Mid-size sedans are the toasters of the automotive world — appliances automakers make for cow-like consumers to buy. 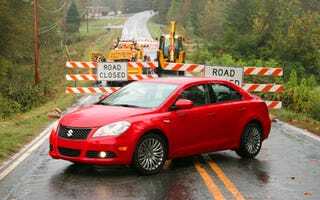 The 2010 Suzuki Kizashi is the newest toaster on the market, trying to be both better and cheaper than the rest. Suzuki wanted me to drive the Kizashi so badly they flew me to North Carolina and fed me salt-and-pepper shrimp fried with the shells on and provided me with 1 GB of files on an 8 GB Sony Walkman. On paper, the new Kizashi isn't overwhelmingly impressive, offering a 2.4-liter DOHC four-cylinder engine putting out 185 HP and 170 lb-ft of torque, good for a 0-60 MPH time of just 7.5 seconds, on par with the Accord EX and faster by 0.7 seconds than the Mazda6. Mileage ranges from, at best, 23/31 MPG with the CVT in FWD configuration and just 20/29 in manual FWD mode with the 17-inch or greater-sized wheels. I immediately snagged a red, FWD GTS model equipped with a six-speed manual transmission, no leather seats but 18-inch wheels. I'd have grabbed a manual AWD version, but one doesn't exist and I wouldn't hold my breath. In a market crowded by vehicles dull in appearance, it at least looks like an angrier VW Jetta in red. On the inside, the new Kizashi is well featured for its expected starting price of under $20,000, offering iPod connectivity, soft-touch plastics everywhere, steering wheel audio buttons, dual-zone climate control and comfortable seats. Move up through the trims and you'll add a thumping 425 watt Rockford Fosgate audio system with Bluetooth music streaming and hands-free calling. It's not the greatest design, lagging behind the Mazda6 and new Accord, but it's better than most domestics and unlike anything in the price range. In a strange twist, the newest Kizashi attempts to be the best value by mimicking the formula abandoned by most automakers. As sedans like the Camry, Altima and Accord have gained in popularity they've increased in terms of size and decreased in terms of enjoyable driving. Even the Mazda6, once nimble and small, has swollen to giant proportions and shed some of its original appeal. The Kizashi is much smaller, 183.1 inches in length, or about ten inches shorter than a Mazda6. Criss-crossing the North Carolina/Virginia border it's clear all the time the Japanese engineers spent at the Nürburgring paid off. It manages to be as forgettable and comfortable as a Fusion or Jetta even across the narrow and poorly-maintained Virginia roads and yet unexpectedly spry on the twisty, high-quality North Carolina streets, making the most of its five-point, multi-link rear suspension and 18-inch tires. Across a wet slalom at the Virginia International Raceway, the CVT AWD version also exhibited precise, predictable results from steering input and a relatively neutral feel, similar to the Subaru Legacy I drove across the same wet course. In extended hot laps, not something you'd ever actually choose to do in such a vehicle, the large-for-the-class vented disc brakes up front exhibited limited fade given the autojourno abuse they'd endured. Around the short south part of the course the manual-equipped model performed admirably, exhibiting little roll and showing great poise around VIR's famous Oak Tree turn (just aim for the oak tree)... for a toaster. Power is lacking in the lower range and RPMs top out at 6,500, so coming out of the turn proved to be the greatest disappointment. It feels underpowered compared to cars it's apparently more powerful than. Falling in between a compact sedan and the current mid-size market, the car is actually more likely to appeal to people thinking about a Civic and liking the added features rather than someone trading down from the benchmark vehicles like the Mazda6 or Volkswagen Passat CC. It's also likely to snag people trading up from an SX4 to something larger. It's hard not to notice that the Kizashi, which went through three iterations of concept cars before the reveal, is seemingly incongruous with the company's recent expression of outdoor, X-game lifestyle vehicles built on their marine, motorcycle and ATV sales. The new Equator can haul Suzuki bikes, the SX4 can take you rock climbing and the the Grand Vitara can haul your boat. The Kizashi doesn't do any of those things. Like the SX4, the Kizashi is part of a rapidly improving family of vehicles few American consumers are aware of, so the failure or success of it is going to be more heavily dependent on marketing than the vehicles themselves. If Suzuki can make people aware they sell toasters and get them into the store, we doubt the company will have a difficulty selling what is, overall, a very good appliance.